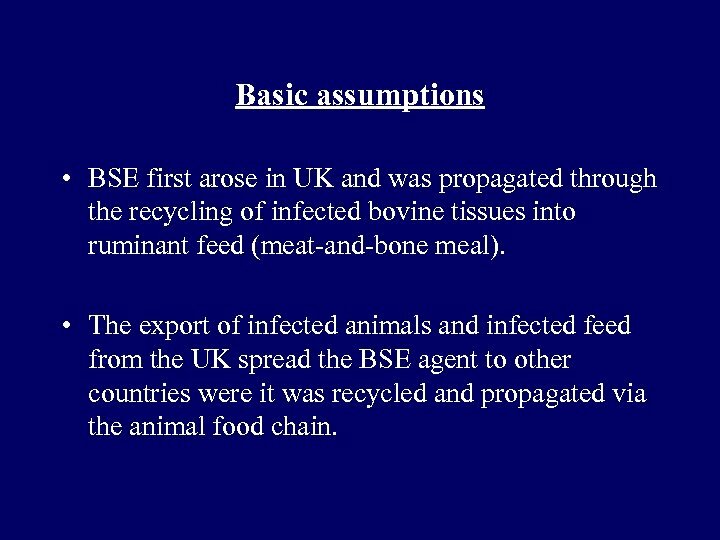 Basic assumptions • BSE first arose in UK and was propagated through the recycling of infected bovine tissues into ruminant feed (meat-and-bone meal). • The export of infected animals and infected feed from the UK spread the BSE agent to other countries were it was recycled and propagated via the animal food chain. 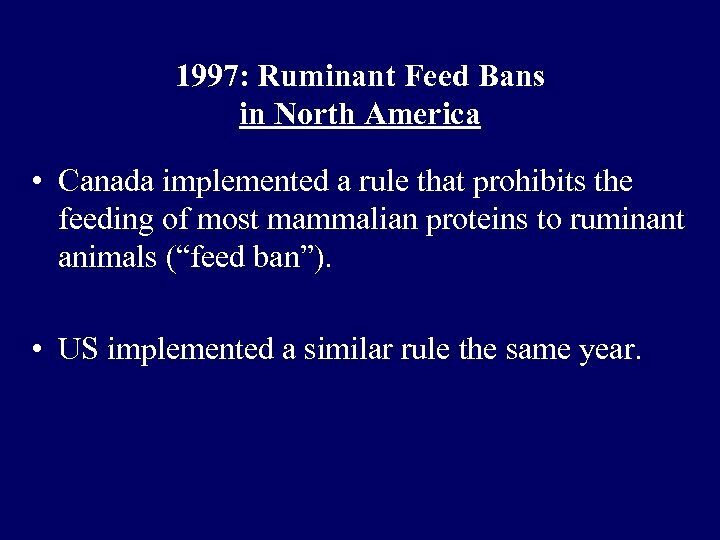 1997: Ruminant Feed Bans in North America • Canada implemented a rule that prohibits the feeding of most mammalian proteins to ruminant animals (“feed ban”). • US implemented a similar rule the same year. 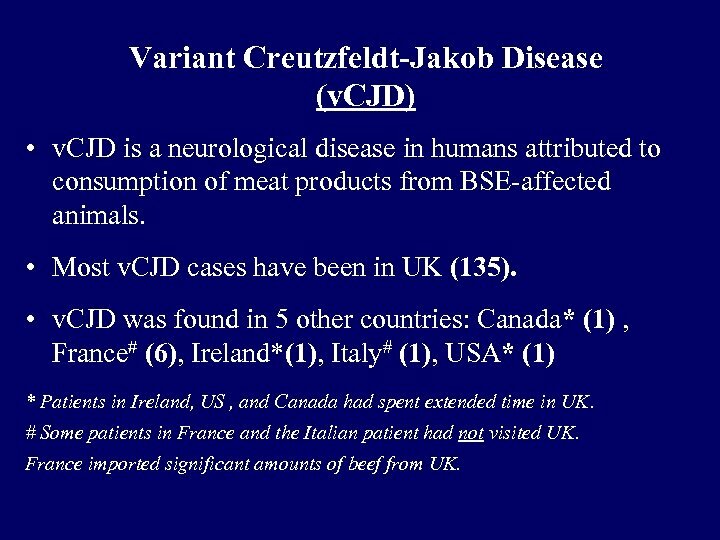 Variant Creutzfeldt-Jakob Disease (v. CJD) • v. CJD is a neurological disease in humans attributed to consumption of meat products from BSE-affected animals. • Most v. CJD cases have been in UK (135). • v. CJD was found in 5 other countries: Canada* (1) , France# (6), Ireland*(1), Italy# (1), USA* (1) * Patients in Ireland, US , and Canada had spent extended time in UK. # Some patients in France and the Italian patient had not visited UK. France imported significant amounts of beef from UK. 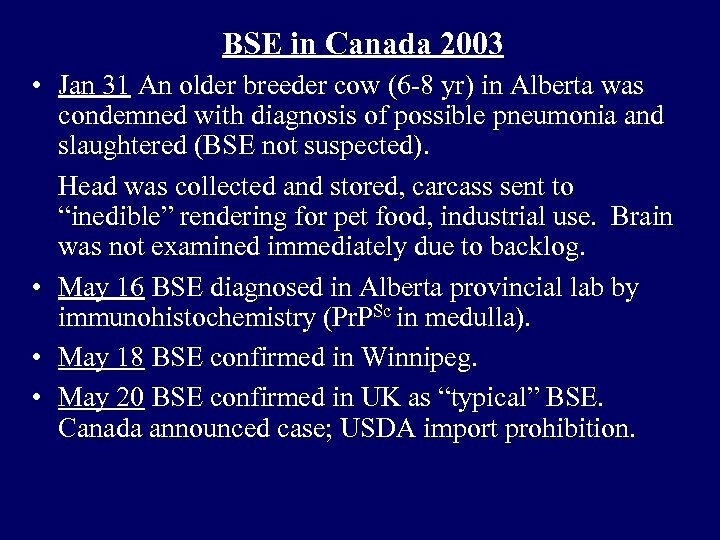 BSE in Canada 2003 • Jan 31 An older breeder cow (6 -8 yr) in Alberta was condemned with diagnosis of possible pneumonia and slaughtered (BSE not suspected). Head was collected and stored, carcass sent to “inedible” rendering for pet food, industrial use. Brain was not examined immediately due to backlog. 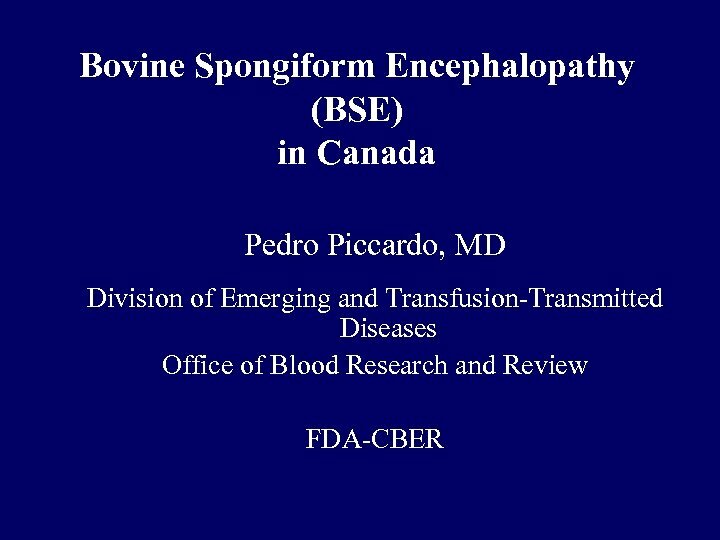 • May 16 BSE diagnosed in Alberta provincial lab by immunohistochemistry (Pr. PSc in medulla). • May 18 BSE confirmed in Winnipeg. • May 20 BSE confirmed in UK as “typical” BSE. 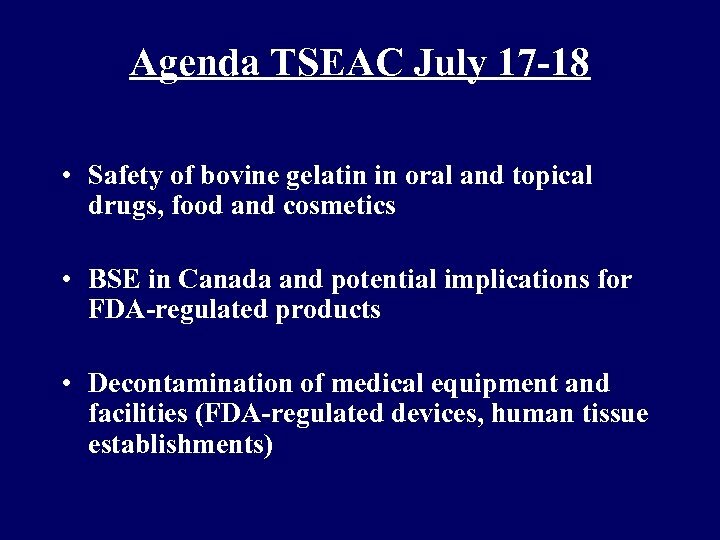 Canada announced case; USDA import prohibition. Rendering • Canadian authorities assured that the carcass had not entered human food chain—inedible rendering only. • Rendered product went to: – 8 feed mills. All farms receiving feed (not intended for ruminants) contacted to determine if any ruminants on premises. If so, they were further investigated. – 2 farms. Depopulated, could not rule out inadvertent feeding of poultry feed to cattle on same premises. – Pet food manufacturer (Alberta). Dog food was shipped to one firm in US. There is no evidence that dogs contract any TSE. US firm asked customers to return food to distributors for proper disposal. 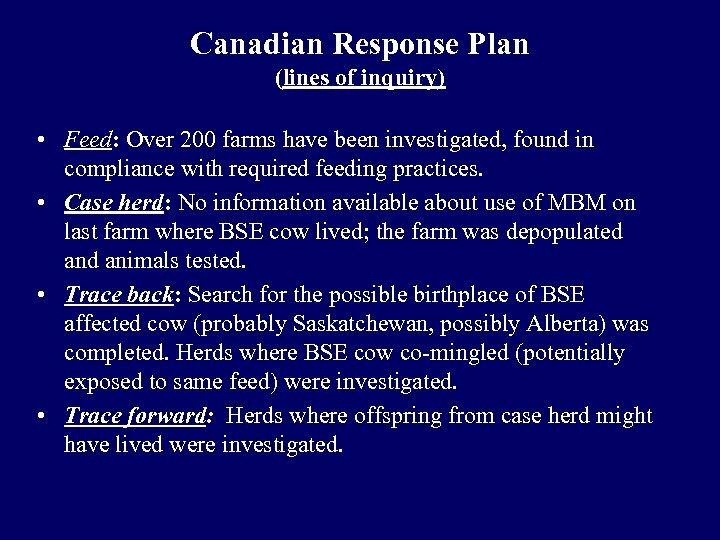 Canadian Response Plan (lines of inquiry) • Feed: Over 200 farms have been investigated, found in compliance with required feeding practices. • Case herd: No information available about use of MBM on last farm where BSE cow lived; the farm was depopulated animals tested. • Trace back: Search for the possible birthplace of BSE affected cow (probably Saskatchewan, possibly Alberta) was completed. Herds where BSE cow co-mingled (potentially exposed to same feed) were investigated. • Trace forward: Herds where offspring from case herd might have lived were investigated. 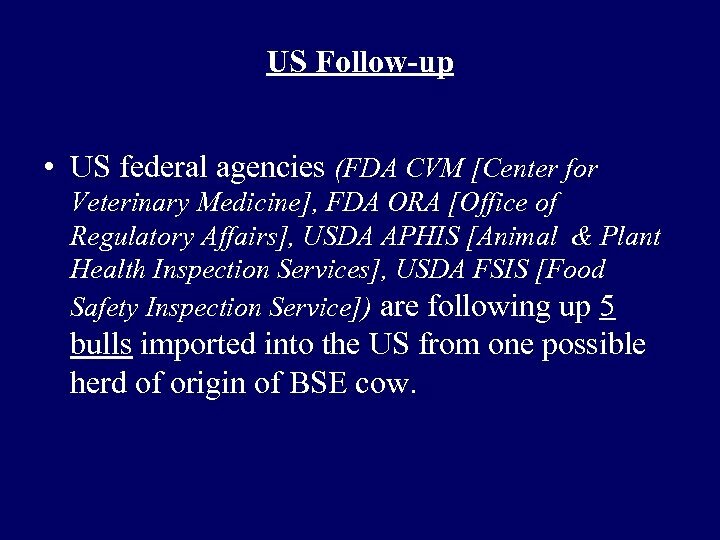 US Follow-up • US federal agencies (FDA CVM [Center for Veterinary Medicine], FDA ORA [Office of Regulatory Affairs], USDA APHIS [Animal & Plant Health Inspection Services], USDA FSIS [Food Safety Inspection Service]) are following up 5 bulls imported into the US from one possible herd of origin of BSE cow. Results • Approximately 2700 cattle brains have been analyzed by rapid test (Pr. PSc ELISA) and immunohistochemistry. • All animals tested negative (except for the single positive index cow). 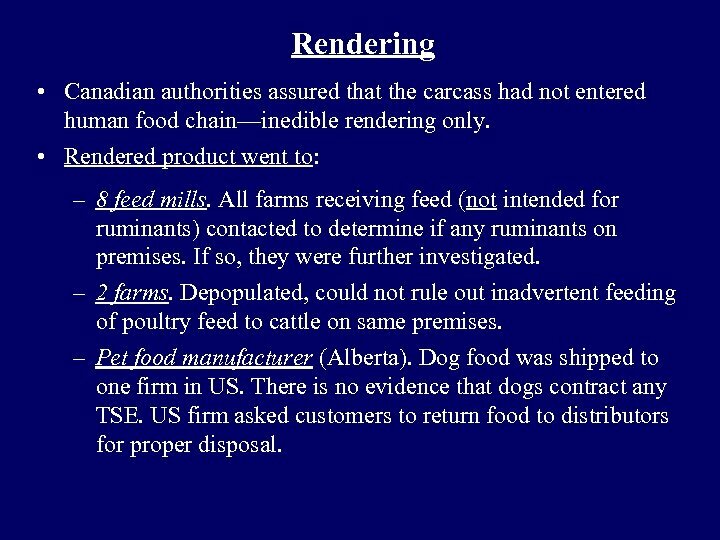 • Approximately 25 farms have been investigated (Alberta, Saskatchewan, British Columbia). 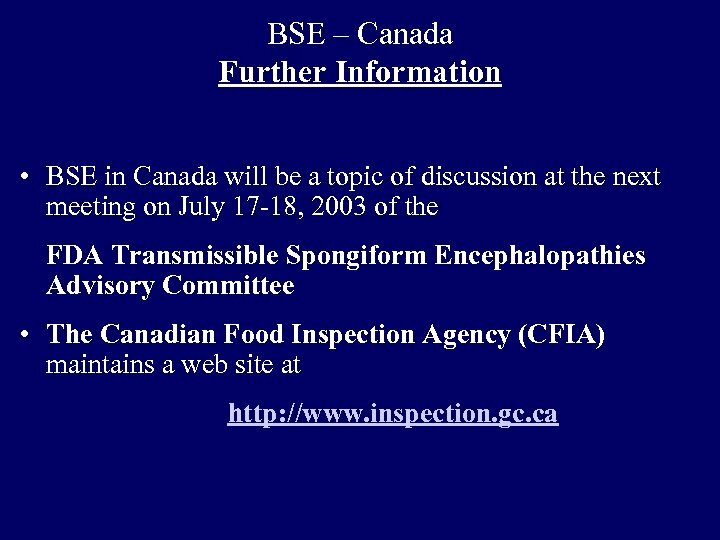 • June 9: Canadian Food Inspection Agency (CFIA) announced that active investigation of the case is ending. Additional testing and information gathering will continue. An international review team (OIE) in Canada is evaluating the situation. 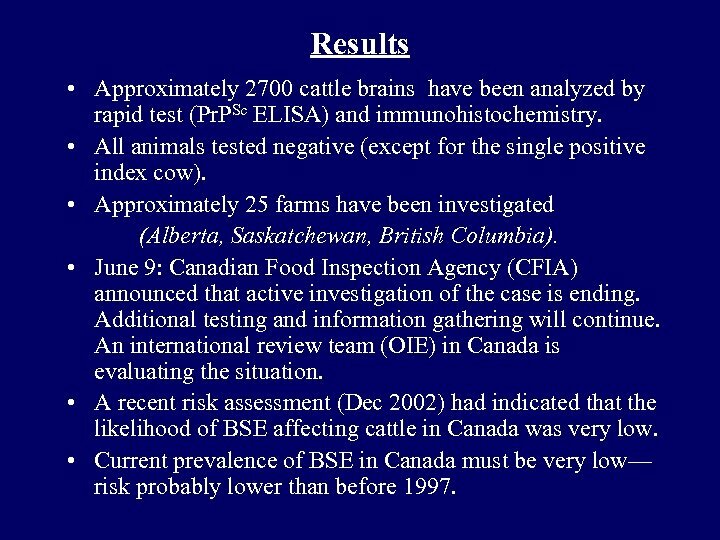 • A recent risk assessment (Dec 2002) had indicated that the likelihood of BSE affecting cattle in Canada was very low. 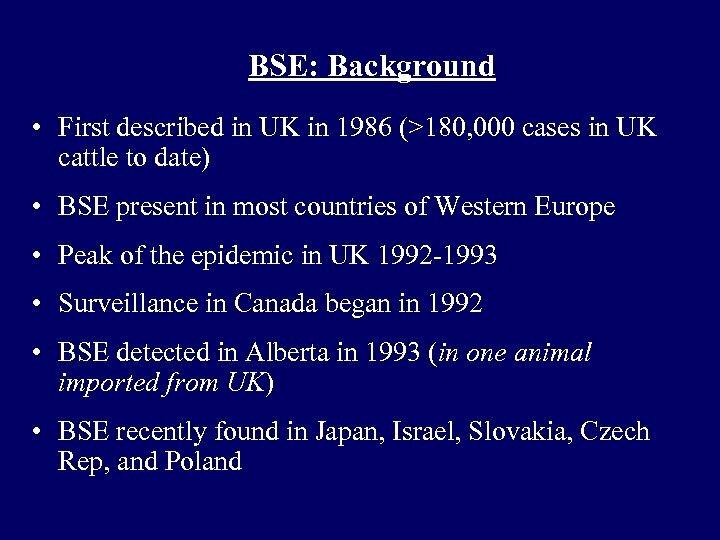 • Current prevalence of BSE in Canada must be very low— risk probably lower than before 1997. Кафедра иностранных языков Милочкина С. И.